I wish I had been given a pound for every time I have been asked how to deal with worms in amenity turf. Worm casts are the curse of every ground care professional and amateur alike - they are unsightly and messy and provide a superb seed bed for weed germination. However, if you have a worm problem in the first place, you should be pleased because it means you have an active soil with good aeration and humus content. Having said that, it is probably no consolation because your lawn in the meantime looks awful and your machinery will be suffering too. So how do you rectify this problem? Avoid leaving leaves on the surface during the autumn and winter because this warm blanket of organic matter is an ideal restaurant for the worms. Do not allow a build up of thatch as again this decaying matter is digested by the worm which leads to casting deposits. keep the grass at a reasonable height. Avoid unnecessary watering as this leads to attracting more worms. In dry weather the worms will move deeper. By aerating regularly you can improve drainage; this will discourage worm activity. Some of the above is counter productive to producing good turf and the finer the grass the greater the problem is likely to be. Inevitably you will need to turn to chemicals and in today's world that may be considered a problem. The law does not permit long-life residual chemical build up in the soil. Gone are the days where a good dose of Chlordane would wipe out the worms. In fact, Chlordane probably wiped out a few groundsman too before legislation got tougher. One product - used by most turf carers - known to be effective against worms , is Carbenzamin. This chemical was primarily produced to deal with fungal diseases such as Fusarium and Dollar Spot but as a side effect was also found to be a good repellent of worms. Carbendzamin disrupts worms feeding near the surface by making the organic matter in which they feed on, unpalatable. Deeper feeding, non casting worms, will not be bothered by the presence of Carbenzamin in the soil, and continue to feed normally. Applying Carbendazim for worm control products is most beneficial in Spring and Autumn and must be carried out when the soil is already wet as the chemical needs help in dispersing through the structure. It is advisable to carry out the treatment when rain is forecast within 24-48 hours but not imminently as run off may effect results as the chemical may end up next door rather than where it's intended. For gardeners looking for an organic, non pesticide, worm treatment, take a look at CastClear. worms are good for the earth and everything you need for your selfish life. get a clue. Hello Mandy - interesting comment but thanks for taking the time to pop in. I personally feel, whatever your views, and I have popped into your myspace profile before commenting, that we all have a certain selfishness in this world because we are all consumers of something. Thanks Ian for your comment. In the respect of Sulphur, you might be interested in reading page 692 of Science and Golf III. I have a terrible worm probem and would be grateful to know where can I purchase Carbendzamin? I am assuming that you are not a professional turf professional which means you will not be able to do so. I would contact a a lawn care company and get them to apply it for you. It is safer, easier and more cost effective. It would be good when someone finally invent a Lawn Conditioner with a Worm-controlling agent in it: Like the Weed&feeds: it will then kill the worms and feed the grass! Does these present chemicals etc do anything to the lawn? I agree that having worm problem in your lawn would be a huge problem. There are lots of option that you can do to minimize or totally eliminate them. You can go natural or synthetic procedure. Let us not forget that these worms cultivate the land to make it healthier. However you have the option to take them out of your property. your advice on killing worms is a bloody disgrace. worms are benefical; a damn sight more than you are. Help is at hand - Control worm casts in domestic lawns - visit www.castclear.co.uk to purchase 1 Litre of CastClear. 1 Litre treats up to 500 sqm. Apply every 10-20 days in the autumn/winter/months. It was show cast at GLEE last week. Initial application 200ml in min 2.5 Lts of water per 100 sqm and then re apply at only 70ml in min 2.5 Lits of water per 100 sqm. It does not harm the worms. i never thought worms could be a problem or that anyone would want or try to get rid of them. there castings are 50% higher in organic matter, seven times richer in phosphate, has ten times the available potash, five times the nitrogen, three times the usable magnesium and is one and a half times higher in calcium. or set up a couple of bird feeders and then stop adding seeds after the initial feeding. the birds should go for the worms. John, it is not the worms that are the problem, just their worm casts at certain times of the year. See www.CastClear.co.uk for more details. I've heard if you sprinkle washing up liquid on your lawn, this irritates the worms and they come to the surface, pick them off and take them away. Sorry to hear that Dee. Im having my grass dug up by skunks trying to eat the worns and they do a good job . I fix the yard and intwo days they are back and the grass is all dug up agin so if I get the worms gone my grass will look good again, I live in the Ca. Any ideas ? I've heard if you sprinkle washing up liquid on your lawn, this irritates the worms and they come to the surface.Thanks for this great post. Something, anything.to rid my INFESTED back yard. It is so bumpy it is very difficult for this old lady to walk on. and it'd getting worse. as for improving the soil??? then why is my lawn dying in spite of putting a good brand of weed & feed on my lawn and watering as the garden experts at the University advise???? When I moved into the house 16 yrs ago there was only a small problem, now it is horrendis. In reading other posts I'm think my ex. 's insistence on "mulching" rather than catching the grass may have contributed to the problem. Ideas, suggestions??? When I was washing the car, I sprikled the remaining pail or water with liquid soap and earthworms started to crawl out. I didnt want to pick and remove them out though because I feel they are beneficial to my lawn. Although part of my lawn looks aweful really due to the castings. Thanks for the great tip. Now going to get started cleaning my lawn today. Beware worms! Tried Cast clear myself . out come crap does not work. 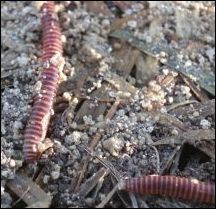 Very nice tips about controlling the worms in fields. five times the nitrogen, three times the usable magnesium and is one and a half times higher in calcium.